As the display industry evolves, we're collectively discovering and analyzing trends that point towards promising opportunities and paths to growth. This is the year where we’re doubling down on publishers, giving you the tools you need to make the most from today’s digital media landscape. One of the ways we’re helping publishers navigate their way to success is by providing new sources of industry knowledge and benchmark data. So today we’re introducing a new report, “Display Business Trends: Publisher Edition”. Is the banner really dead? If you mean the 468x60 banner, then it might be time to hold a wake. This ad size dropped down to 3% of all impressions. Brand-friendly “premium” units are gaining share and we’re seeing that smaller ad units are dropping in popularity. However nearly 80% of all impressions are the ad unit “three musketeers”: the medium rectangle, leaderboard, and skyscraper still comprise the vast majority of ads served. 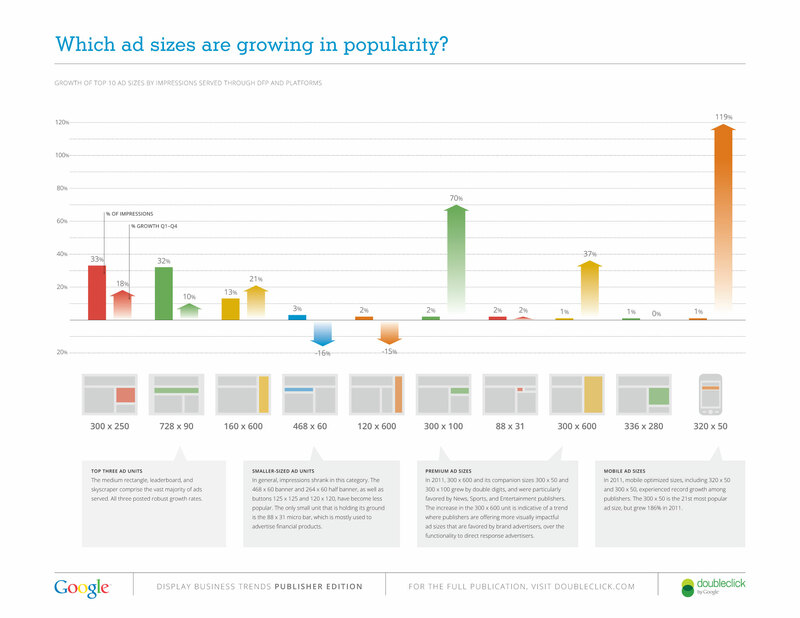 What types of sites are showing strong impression growth? In 2011, we found that Shopping, Sports, and Auto & Vehicle sites were some of the fastest year-on-year growth verticals on the Ad Exchange and AdSense. We saw impressive figures across the board, with 15 out of 25 publisher verticals displaying double-digit growth. Are your sell-through rates getting a 17% holiday bonus? Anecdotally we’ve heard that publishers’ sell-through rates increase at the end of the year, thanks to higher advertiser holiday spending. We’re now able to quantify this end-of-year shift, and we found that the global publisher sell-through rate increases from 36% to 42% in the fourth quarter. 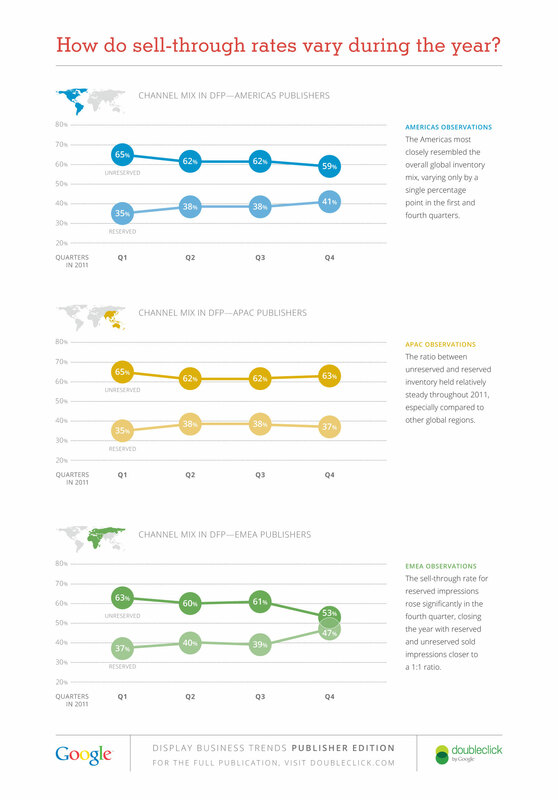 Comparing the regions in 2011, European publishers experienced the greatest sell-through boost, increasing to 47%. How fast is the growth in mobile and video? Growth in mobile usage has exploded, with mobile web impressions on the Ad Exchange and AdSense platforms increasing by 250% from the third to fourth quarter in 2011. Over the same period, video ad impressions increased nearly 70% across the DFP Video platform. Where in the world are you? All over, as it turns out. 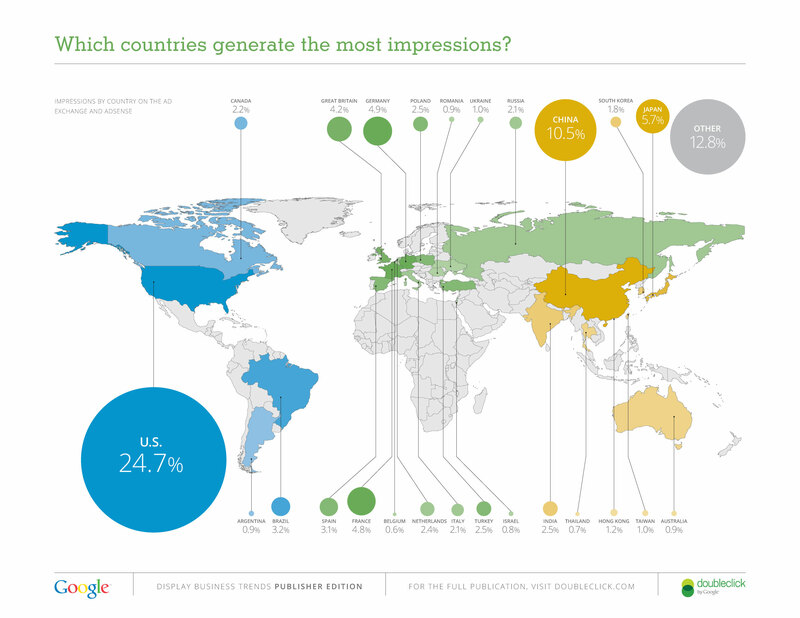 Of a possible estimated 245 different countries and territories, we saw publisher ad impressions from 235 of them. These included the island country of Palau - one of the world’s newest sovereign states - and the middle-African nation of Equatorial Guinea, with astounding growth rates of 1106% and 4635% respectively. And while the United States still accounts for the highest percentage of impressions overall, we’re seeing a significant representation from China and Japan, coming in at 11% and 6% respectively. These metrics are a beginning: they give a snapshot of what’s happening in an ever-changing industry. We hope this sparks conversations across the marketplace about the trends driving these metrics, and how publishers can best capitalize on them to grow their businesses bigger, faster. For our part, we’ll be continuing the conversation at DoubleClick Insights on June 5th, where we’ll be live-streaming our discussion on the future of buying and selling ads online. We hope you’ll join us there! Posted by Jonathan Bellack, Director of Product Management, Display Advertising.